PelFind is a photo discovery app that turns web pages into photo albums. Just provide a url of a web page, and PelFind will extract all photos in it into an album. 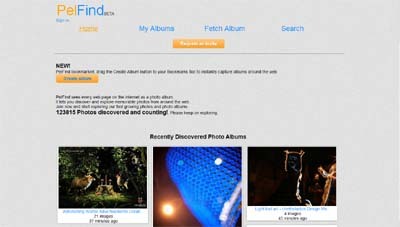 You can also navigate the site and create your own albums from the already submitted albums. PelFind doesn’t just look for a single photo, but a collection which describes something. Which means, photos on PelFind tell a story.